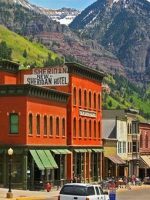 This is one of the most charming and darling lodges in the historic town of Ouray, Colorado. Many people refer to this town as the Switzerland of America. 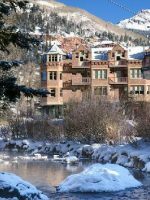 Ouray is known for its incredible hot springs and ice climbing. Box Canyon Lodge & Hot Springs truly shines as this property has its own hot spring channeled into multiple hot tubs throughout the property connected via bridges and gorgeous paths. That is another thing families will note about this property, the lush landscaping. It’s obvious the owners take such pride into the grounds and upkeep of this hotel. Room choices include standard rooms to suites to apartment suites. 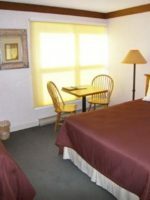 All come standard with A/C, coffeemaker, microwave, refrigerator, ironing board and iron, hair dryer, free Wi-Fi and TV. 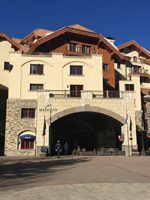 There is ample parking on site, and usually very close to the entrance of the hotel room. There is a light continental breakfast available in the lobby area each morning. 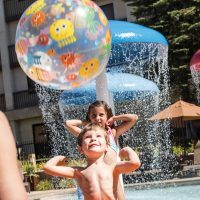 The concierge is extremely helpful in identifying fun family activities and helping with recommendations. 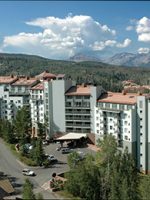 The hotel is ideally situated right in the town of Ouray, and close enough to walk to all the restaurants, shops and entertainment. Located on a quiet end of the street with a great country mountain setting. Had moved to a different room (didn't like that the room over us was occupied). They not only gave us a VERY quiet room but also moved all of our luggage (I am talking big suitcases) to the newer room. They really make difference to make the guests comfortable! Rooms are older in a country charm way. It was a slow time of year so I do not know about the quality of the sound between the rooms. My Bf and I decided to take a day trip to Ouray! And this hotel was awesome. Front desk staff is awesome and very welcoming. The hot springs were great. Its scary to make a decision on a hotel when traveling to a small town but this place is great. I highly reccomend.